Team logos represent the playing card strength. Defender card is always stronger when having same or more number of logos. There are three type of action cards Attacking, Defending and Manager. Attacking and Manager card action is to score a Goal. Defender card action is to prevent the Goal being scored. 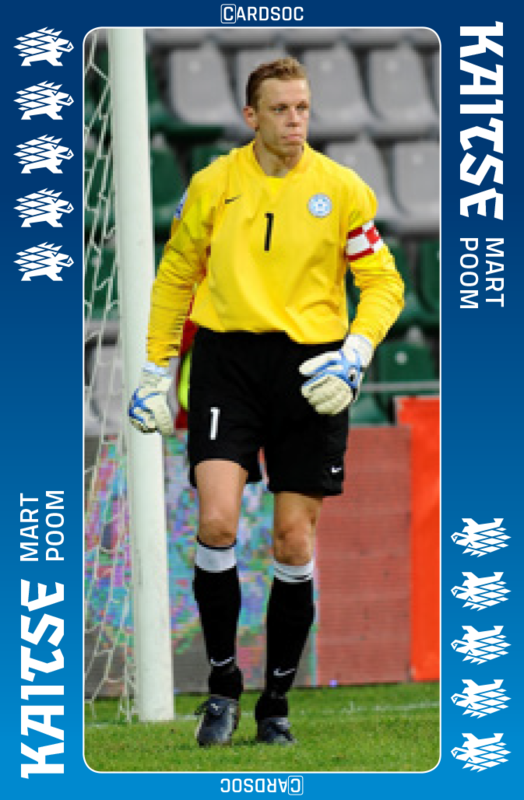 Each card includes the player name. Do you recognize the player? You can start collecting signatures of your favorite players. Card Soccer is an easy and thrilling card game that simulates soccer. One card deck includes 40 playing cards. Twenty attack cards called Rünnak and twenty defence cards called Kaitse. The manager card called Treener is one the of attack cards. Before the game, both attacking Rünnak card decks and defensive Kaitse card decks need to be shuffled separately. Both decks are placed separately, and each player draws three cards from both decks. After each playing Round, players will draw a new card to replace the already played card. All played cards will be kept separately and cannot be used again during the game. The game will end when all the cards have been played out. Starting player will be decided by coin-toss. Winner will decide who will start attacking. Game is played in turns. 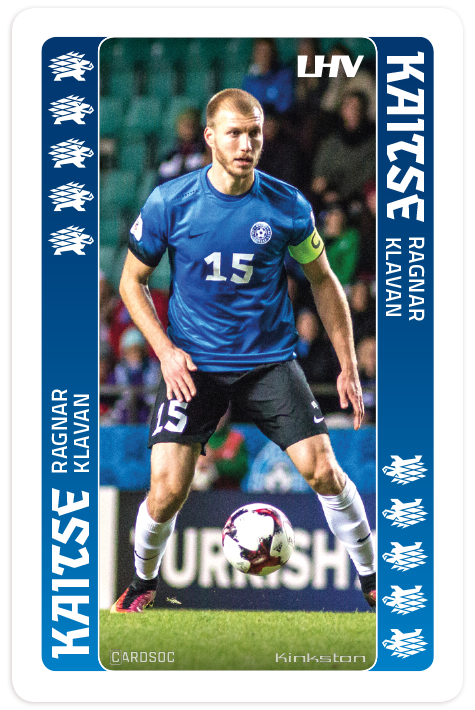 The first player will always start with an attack card (Rünnak) and the other player will respond with a defensive (Kaitse) card. When a defending players’ Kaitse card is stronger than the attacking players’ Rünnak card - No Goal is being scored during that turn. When the defending player does not hold in his hand a stronger defensive Kaitse card – a Goal will be scored during this turn, and the attacking player can draw a random defensive Kaitse card from the second player’s hand and place this card in the already played card deck. To check the strength of the card from the added “Card Strength” rule card. Both players should keep the score during the game and the player who scores the most goals, after all, cards have been played, will win. If after playing all the cards, the game ends up in a tie, then the game will continue with a penalty shootout that decides the winner. Exception! Attacking Treener (Mana- ger) card gives the attacking player an opportunity to draw from the opponent’s deck a played Kaitse card. Attacking Treener (Manager) card has 3 logos and defeats defensive Kaitse cards with 1 logo and 2 logos. Both card decks will be shuffled again and now each player will receive five attacking Rünnak cards and five defensive Kaitse cards. The player can then decide the order the cards that will be played during the penalty shootout. Both players will place their penalty shootout cards on the table. The starting player who starts the penalty shootout is decided by coin-toss. Penalty shootout follows the same course as the actual earlier gameplay. When the attacking Rünnak card is stronger than defensive Kaitse card – a Penalty is scored. When an attacking Rünnak card is not stronger than a defensive Kaitse card – a Penalty is not scored. Both players need to keep the score during the penalty shootout. The player who scores the most penalties is the winner. If score is still tied, then the game will continue with the extra penalty shootout turns. Exception! 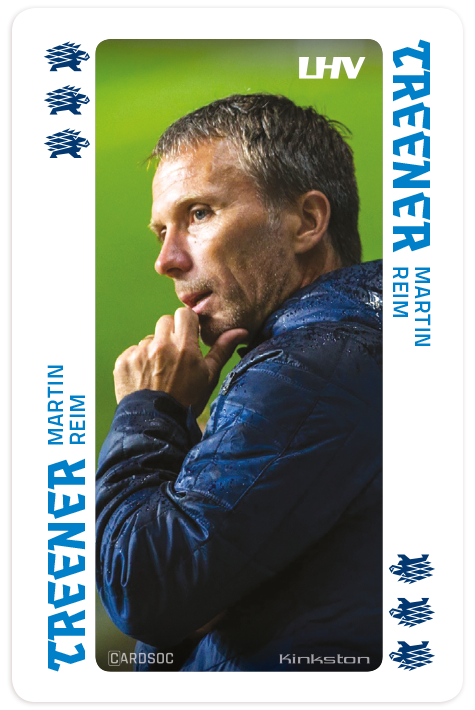 During penalty shootout, the Attacking Treener (Manager) card is played like a regular attacking Rünnak card with 3 logos. Both card decks will be shuffled again and now each player will receive five attacking Rünnak cards and five defensive Kaitse cards. 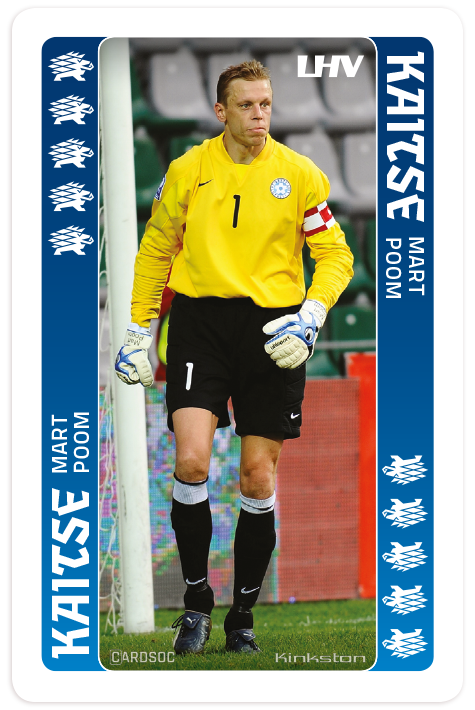 A Player can decide the order the cards that will be played during the penalty shootout. Both players will place their penalty shootout cards on the table. The order of the penalty shootout is decided by a cointoss. Penalty shootout follows the same course as the actual gameplay. 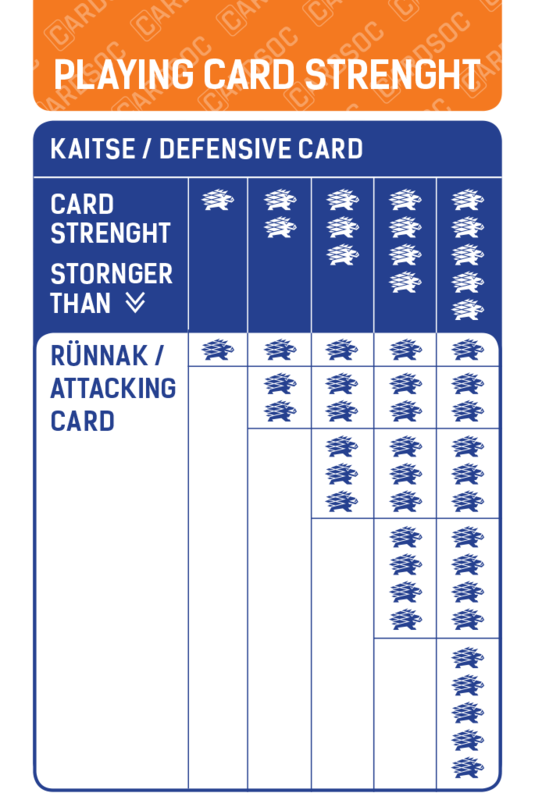 When an attacking Rünnak card is stronger than defensive Kaitse card – a Penalty is scored. When an attacking Rünnak card is not stronger than defensive Kaitse card – a Penalty is not scored. Both players will keep the score during the penalty shootout. The winner is the player who scores more penalties. If the score is still tied, the game will continue with extra penalty shootout turns. The Treener card is part of the attacking Rünnak card deck. An attacking Treener (Manager) card gives the attacking a player an opportunity to draw from the opponent’s deck an already played Kaitse card. Attacking Treener (Manager) card has 3 logos and is stronger than defensive Kaitse cards with 1 logo and 2 logos. 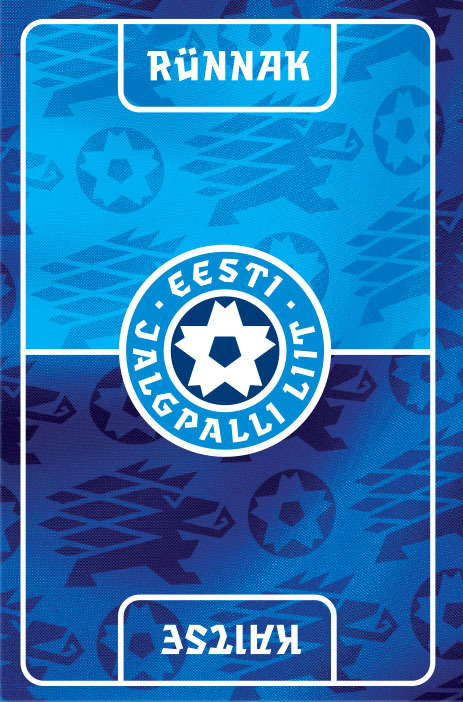 (Manager) card is played like a regular attacking Rünnak card with 3 logos. Mission – Make life fun for people through games! Key to success is on teamwork!